Kamryn Shannon, Ephrata HS: "For Love of the Game"
Together. Fight. Passion. Compete. Unity. 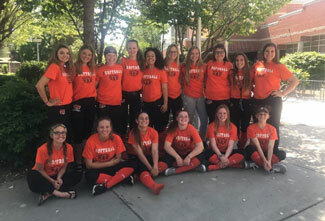 Heading into spring sports, Ephrata High School’s softball team was getting restless. Maybe it was the fact that the seasons were turning and we were all itching to be able to get outside and not freeze up the second we take a step out the door. Though, the real reason for our excitement might have been that we had been waiting all school year to be out on the field and competing. We’d been dying for the days when practice ends, and our faces are caked with a combination of sweat and dust. We’d been looking forward to the days where we think the dirt line left from our t-shirt is a tan line. We’d been counting down the days to pick up our gloves and bats again and get to work. Maybe to some that’s not their idea of fun, but no matter the sport every athlete has those moments where all the atoms in their body start moving at the speed of light because they have absolutely fallen in love with the game that they know they are so lucky to play. They’ll go all out; their drive to compete will radiate off of their body. The amount of preparation, emotion, and time put in lights a fire behind their eyes. I know that for my team, we commit. We commit to the game. We commit to each other. We hold each other accountable and we strive to be 1% better every day. I can count on every single one of them to have my back just like they know that I have theirs. The bonds that we share, the emotion that we have all witnessed and been a part of on the field, and the trust that we have built all strengthen the unity that we have all worked so hard to for. In our program, we have a couple sayings that we take to heart. The first is “Be the first to serve, and the last to be served,” which can mean many things like be the first one to get the equipment, to run after a stray ball, or grab someone else’s equipment for them if they were the last at bat for the inning but remain humble through it all. Don’t expect that you will always have someone there to pick up for you and be accountable. Our second saying is “Everyday is a tryout.” In other words, at no point in time are you guaranteed your spot on any team. We have to go out and earn our position every single practice because there are always other athletes who are working for those spots and putting in the time just as much as you might be. But this doesn’t just account for athletes in softball or just the athletes at Ephrata High School. So, let me ask you, when you love the game, when you can’t imagine not being able to play, do you take the minutes you do have for granted? Do you strive to be 1% better? Is the bond that you share with your team just as unbreakable when it’s off the field or court? Do you treat every day like it’s a tryout? My team isn’t perfect, we make errors and strike out, but the unbelievable drive to compete with everything we’ve got and our ability to win or lose with our heads held high is something that I am incredibly proud to say that I am apart of. And I am incredibly lucky to play with such an amazing group of girls. So, if any of my teammates are reading, thank you for every moment of hard work, every memory made, and every exciting adventure to come! 4/23/2019 Brenden Archer, Shadle Park HS: "Bringing About a Renaissance"